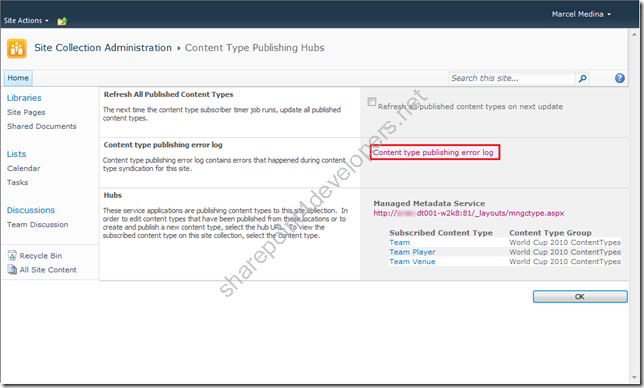 In this article we will check out a new feature in SharePoint Server 2010 called Content Type Hub, which allows the Content Types centralisation and sharing through the Metadata Service Application. You will understand how it works, how to configure it, how to publish and consume Content Types and some troubleshooting. 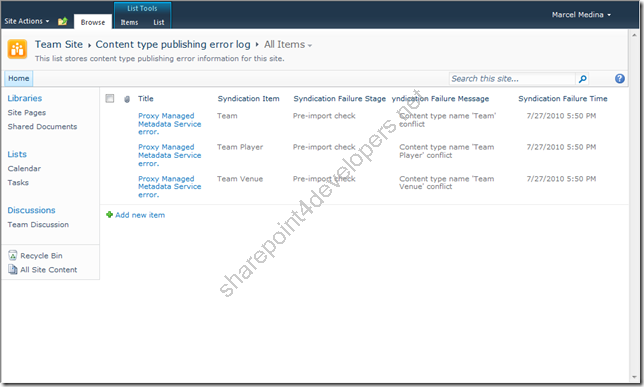 In this article we will check out a new feature in SharePoint Server 2010 called Content Type Hub, which allows the centralisation and sharing of Content Types through the Metadata Service Application. You will understand how it works, how to configure it, how to publish and consume Content Types and also some troubleshooting. Widely discussed when using MOSS 2007, the Content Type Sharing was always problematic, because once the Content Types are created in a single Site Collection, they cannot be shared among other Site Collections (there is no OOTB resource for that). This new feature is available through the Metadata Services Application, which maps the Site Collection in which the Content Types are shared, working like a Hub. The concept of its operation is very simple, basically the Content Type Hub publishes the Content Types and through the Metadata Service Application they are replicated to the Subscribers. These subscribers can be Site Collections that are in different Web Applications even in different Farms (if you wish it). 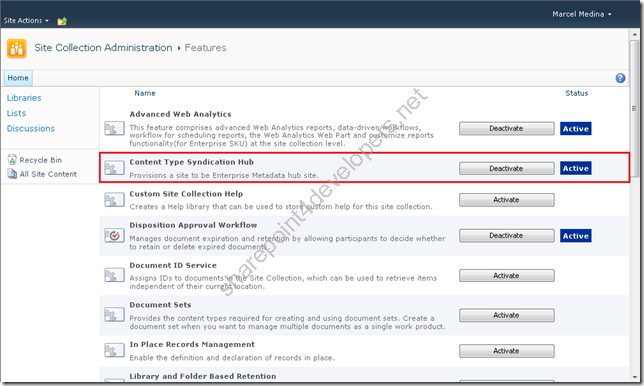 Note: At the moment this Feature is activated the Site Collection is provisioned as the Content Type Hub. 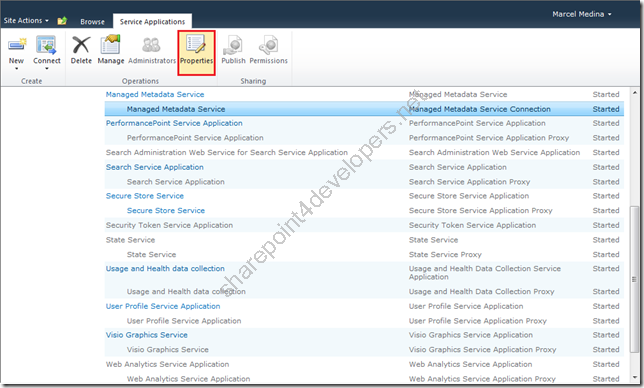 The Metadata Application Service is a service for sharing metadata, whose main feature is the storage of keywords and term sets (which is not discussed in this paper) and as optional feature to serve as a Hub for Content Types. In the Farm is possible to have zero or more Metadata Service Applications and this criterion depends entirely on the Design of your solution. In this approach we need only one running service application whose connection will consume only one Content Type Hub. In order to consume more than one Content Type Hub, you need to create another service application for that. This is applicable in case you want to create different scopes for Content Types, e.g. 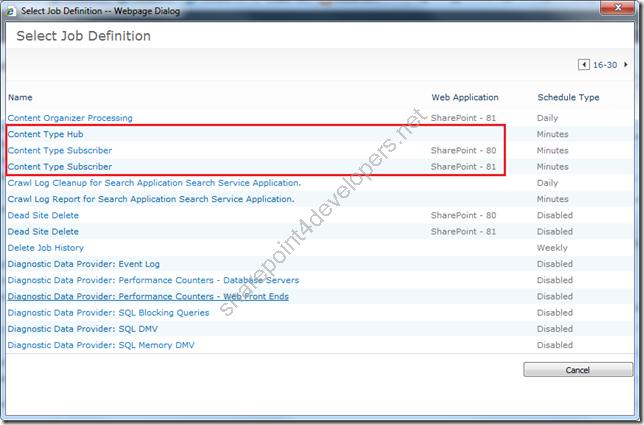 the separation of Content Type Hubs for consumption in an Intranet Web Site and the other one in an Internet Web Site. 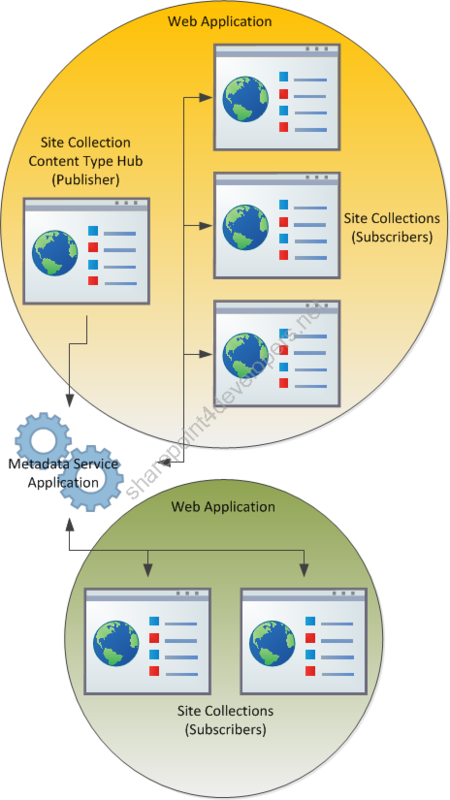 Here we are addressing only the planning of the Metadata Application Service as a Hub for Content Types, but if you're interested in exploring more about this service application, see the references in this article. Note: An important point to be commented is that once the URL Configuration for the Content Type Hub is set, this cannot be changed by the user interface. 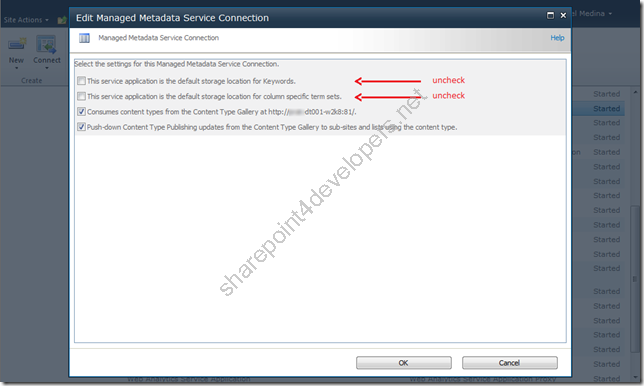 If you want to change it after the Service Application is created, use this approach for updating the Metadata Service Application. OBS: Only one default storage location for keywords and term sets is allowed in a Web Application, thus let these options available until you decide to use them. 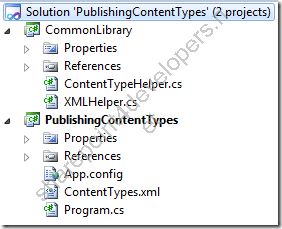 The Site Columns and Content Types referenced in the posts Creating Site Columns Programmatically via XML and Creating Content Types Programmatically via XML are going to be used in the Hub, because they will serve us as examples of Content Types to be published. Note: Just deploy the Site Columns using the script provided. 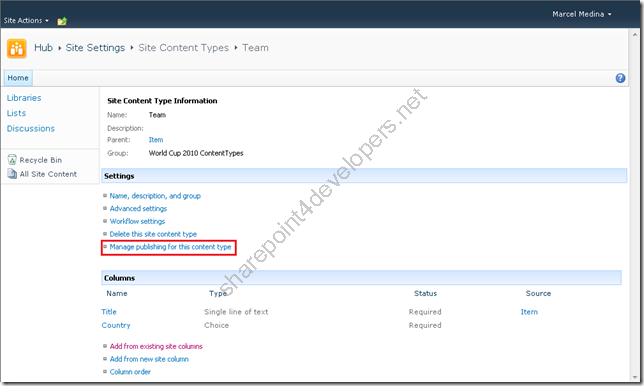 Use another approach for deploying the Content Types, according to this post SharePoint Lesson Series – Lesson 2 – Content Types – Part I. 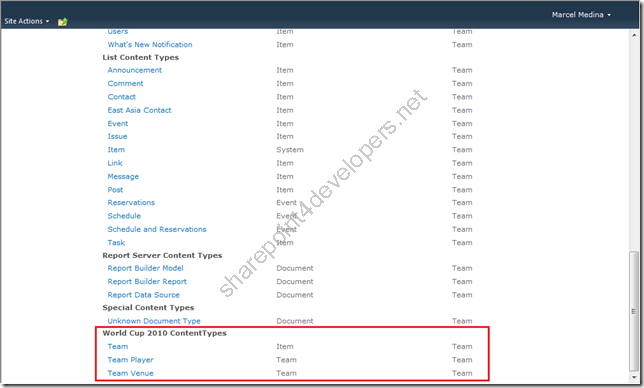 Once these objects are created, start publishing the Content Types. This task can be done manually or programmatically. I'll show you both. It is worth remembering that, only for purposes of understanding, Content Type Syndication is the definition to the way that Content Types are organized and shared between Lists and Libraries, which is precisely what we are doing with their publishing using the Content Type Hub. If you prefer to automate the publishing process (especially if you have multiple Content Types), use the code below for this task. 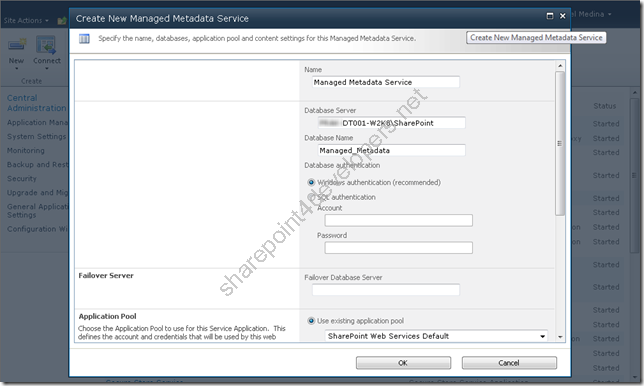 Note: Be aware of the utilisation of the namespace Microsoft.SharePoint.Taxonomy, which refers to the assembly Microsoft.SharePoint.Taxonomy.dll, which is only available in SharePoint Server 2010 (directory 14\ISAPI). // Check to see whether the site is a valid hub site. // Check to see whether this content type has been published. // The provided site is not a valid hub site. 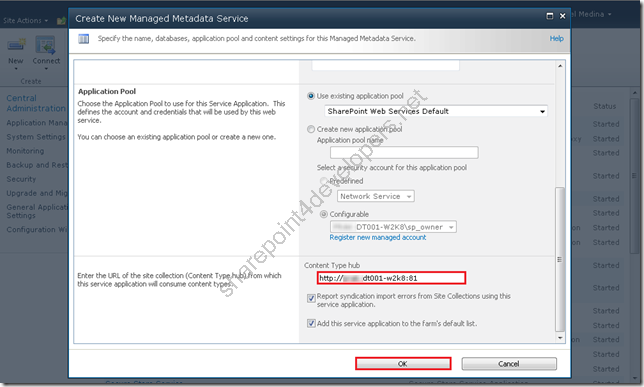 In order to consume the Content Types of the Content Type Hub, make sure you are referencing the Metadata Service Application that offers the service application. This applies only if you are using another Web Application as Hub, otherwise you're already entitled to use it within your Web Application. Note: Notice that I have two Web Applications, the 81 serves as Publisher and the 80 as Subscriber. Both use the same service Managed Metadata Service. Note: By forcing the execution of the Timer Jobs above, always trigger the Content Type Hub (Publisher) first and then the Subscribers. The execution is asynchronous, so despite the status changes quickly after triggering the job, probably it will still be running. 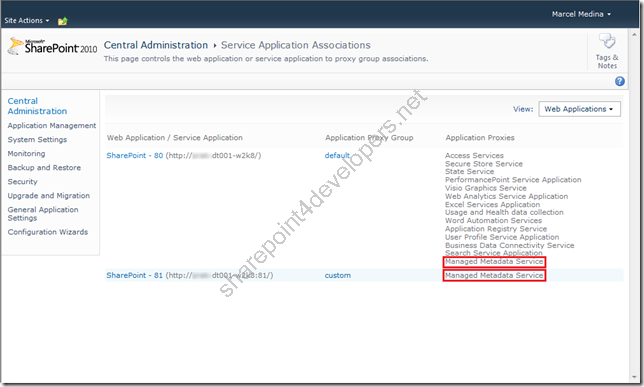 Note that there are two Subscribers consuming the Content Types (port 80 and 81) even though the Hub is on port 81, just because other Site Collections within the same Web Application can take advantage of Content Types. Another possible way is exemplified in the section “Troubleshooting” below. Nothing is perfect, you will always face problems that appear in the middle of the road. Welcome to the Real World! NOTE: The figure above shows a successful outcome, because all the Content Types were published correctly (what should happen in your environment). This figure is only used to display where to find the possible publishing errors. Another point to be reviewed is regarding the Refresh of all the Content Types published. If you wish to force an update of the Subscriber, which has changed for some reason, leave this option selected. 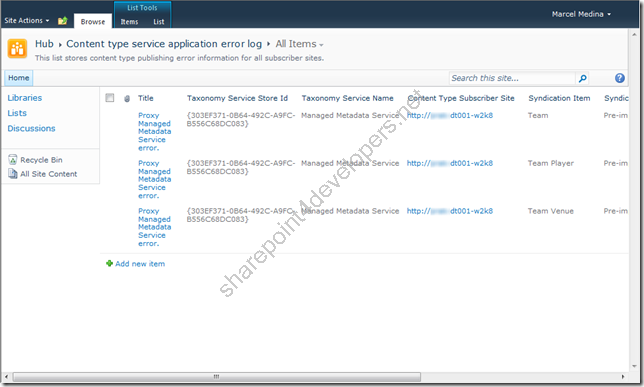 This will overwrite the current Content Types with the version of the Publisher. 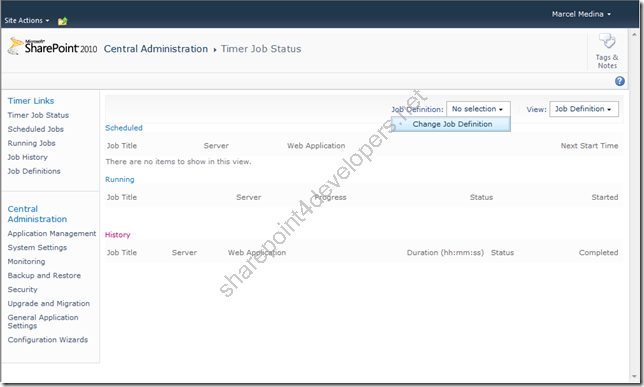 Features can be used to deploy content types in the Hub. They are always the best practice. Just be aware that this will create a dependency on them with a FeatureId, and by doing this, when you publish the content types, the same Feature on the Site Collections Subscribers will be required, so you can get the content types published. 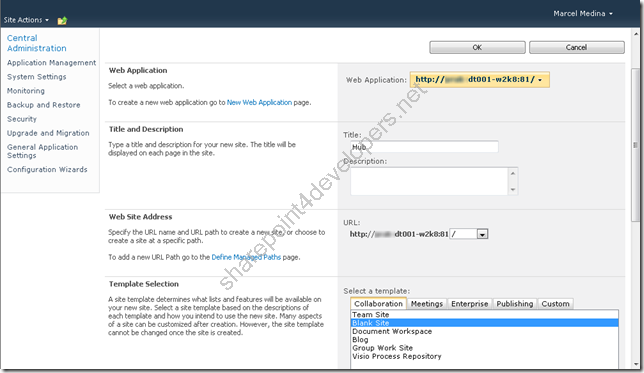 Other option is to use a Powershell script or Console Application. 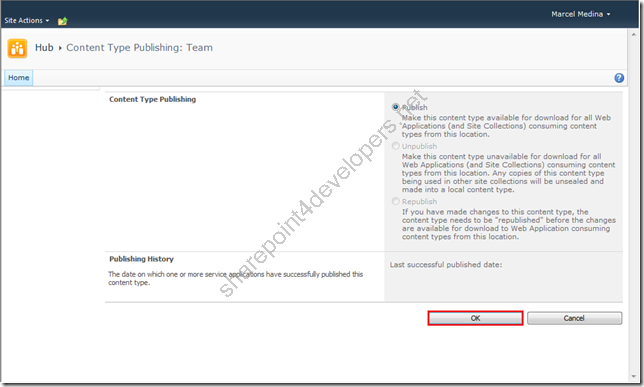 In this case, when you publish the content types, there is no need to activate any feature in the Site Collections Subscribers.